Trinity’s Rock & Pop syllabus changed in 2018. Are you up to date? Learn more about how to chose your songs, what happens in the exam, how is it marked and how can your students can get the best possible marks. Your students might be great at playing the Rock & Pop songs for the exam - but what about the Session Skills? Whether it is Playback or Improvising, these are worth 20% of the exam - so it is important to make the most of this important section of the exam in this practical workshop for all levels. Nicholas will give you a foolproof step by step guide through this aspect of the exam. And for more classical teachers of the piano, are your pupils getting a bit bored with playing classical music? Are their interests with more popular music? 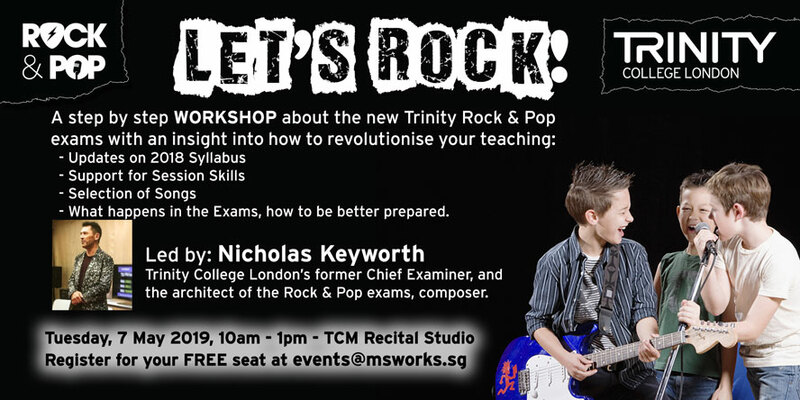 Then perhaps Trinity’s Rock & Pop keyboards syllabus is just what you have been looking for. Pop Goes the Piano is exactly what you need to help understand more about teaching Rock & Pop Keyboards. It’s fun, it is different and it is not as scary as you think! Trinity Rock & Pop - LET's ROCK!